A photographic exhibition combining a collection of photo’s and quotes of residents is the result of an intergenerational art project created at Victorian residential care facility Mercy Place Wyndham. “I usually create a two page collection of quotes on each subject, which I take from a variety of sources ranging from the Bible to movie stars,” Ms Frykberg explains. Ms Frykberg was so impressed with the wisdom residents were sharing during these sessions, that she started collecting the quotes. “I thought the residents’ advice was too good not to share. On the theme of tragedy, one resident said ‘My tragedy happened 40 years ago, yet even now, each day I have to keep accepting it’. “On learning, a 96-year-old resident’s mantra was ‘Each day, you should learn a new thing’,” Ms Frykberg continues. She then came up with the idea for an art project titled Reflections - The Wisdom of the Elders and invited Vocational Education and Training (VET) media students from MacKillop College in Werribee to capture images of the aged care residents during one of their weekly reflection sessions. The result is a photographic exhibition consisting of large black and white photos combined with each resident’s quote. 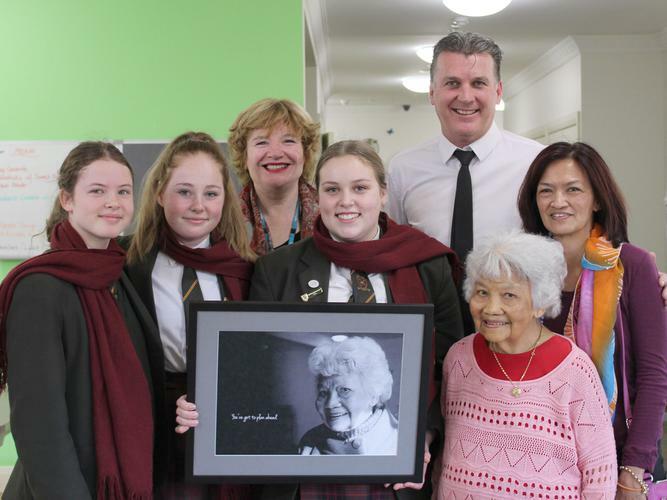 The images were unveiled earlier this month in front of residents, staff and Mackillop College students. “The exhibition is truly something special and it’s been a wonderful intergenerational experience for both our residents and local teenagers to work on together,” Ms Frykberg says.